The capital investment surge making its way through the Coastal Bend economy is a direct byproduct of Corpus Christi's historic strength in the energy and petrochemicals sector. Iain Vasey, president and CEO of the Corpus Christi Regional Economic Development Corp., puts it bluntly: "The impact this investment has had on our local economy has been significant: with $35 billion to $40 billion in new investment announced during the past five years and companies building in our area from around the world, including Austria, China, Italy, and Brazil, we are capitalizing on our deepwater port, great educational assets and business-friendly climate to experience unprecedented growth." Indeed, Corpus Christi anchors a region like none other in the entire US. The closest industrial site to the Eagle Ford Shale, Corpus Christi is home to five refineries, two ethane producers and two splitter plants opening soon. Pipeline infrastructure is already in place for new energy producers, and there are large industrial sites available with access to three Class I railroads and the fifth largest deepwater port in the nation. Serving the petrochemical sector is a large labor pool that is skilled in both oil and gas processing. Del Mar College has tripled the size of its process technology program to supply skilled workers for industry growth; and the industry-funded Craft Training Center offers multiple programs for new students and industry workers who come back to renew certificates or to receive additional training. With aid from City Type A funds, the Craft Training Center doubled its size in just three years. All of this investment into workforce and infrastructure is paying off. 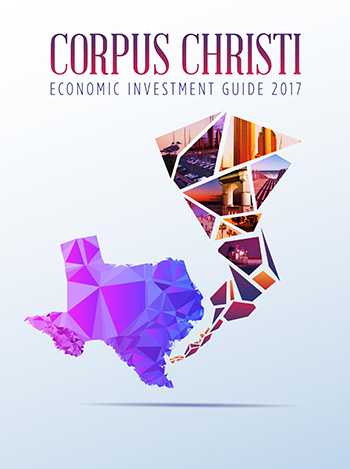 In 2015, Corpus Christi landed a record $17.83 billion in total capital investment and 2,503 new jobs, with the vast majority of both coming from the energy sector. Huge investments into Corpus Christi came from Occidental Chemical ($1.3 billion and 61 jobs); LyondellBasell ($500 million and 18 jobs); Castleton ($400 million and 35 jobs); Magellan Midstream Partners ($350 million and 110 jobs); Gravity Midstream ($200 million and 25 jobs); and Celanese ($150 million and 106 jobs). The investment wave is far from over. In the petrochemical manufacturing sector, business should keep booming, according to the Chemical Activity Barometer published by The American Chemistry Council. The index increased by 3 percent for the year ending July 31, reaching a record all-time high. The ACC estimates that more than 250 petrochemical plants are either planned or underway around the US through 2023. These projects account for $160 billion in investment and 70,000 jobs. About $50 billion of these facilities are going up in Texas alone. Sharply lower energy prices, including historically low prices for natural gas, are driving dramatic increases in production in the non-energy sectors of the economy, particularly plastics and chemicals manufacturing. As a result, companies in these sectors are increasingly willing to spend large sums to build new plants and expand existing facilities. Case in point is a joint venture between ExxonMobil and Saudi Arabia Basic Industries Corp. (SABIC), a company owned by the government of Saudi Arabia. The JV plans to invest billions into establishing what would be the world's largest steam cracker plant at a massive petrochemical complex on the Gulf Coast. The plant, which based upon its projected size could cost upward of $10 billion, would be capable of producing 1.8 million metric tons per year of ethylene that would feed a monoethylene glycol plant and two polyethylene plants. Monoethylene glycol can be used to make polyester for clothing and polyethylene terephthalate (PET) for beverage bottles and containers. Polyethylene can be used in a range of applications, including packaging, consumer and industrial products, agricultural film, and building and construction materials. The joint venture is considering two sites in Texas and two in Louisiana. The Texas sites are in Victoria and San Patricio County in the Corpus Christi area; the Louisiana sites are in Ascension and St. James parishes, both of which are between Baton Rouge and New Orleans. "If studies and market conditions support moving forward, the project would be located in the Gulf Coast region in either Texas or Louisiana," says Margaret Ross, ExxonMobil public and government affairs executive. "Both states provide access to locally available, abundant natural gas feedstocks as well as required infrastructure. We are working with state and local officials in both states to help identify a potential site. If the project proceeds, the multi-billion-dollar investment is projected to create significant state and local benefits, generating thousands of jobs and stimulating positive economic growth." Ross adds that construction of this world-scale facility, which would have a footprint of more than 1,000 acres, would take up to five years. Ross also notes that "incentive discussions are underway with state and local entities. We are not in a position to discuss the details at this time." If incentives are a key factor in the final site decision, then at least one energy industry expert in the Gulf Coast region expects Texas to have an edge in this high-stakes competition. "It would be my expectation that Texas and Louisiana will get competitive," says Dr. Loren C. Scott, a Baton Rouge-based economist and consultant who specializes in analyzing the energy sector. "It is dicey in Louisiana right now because of our state budget crisis. We had some big increases in state business taxes here. It is just a matter of math, bottom line. When we raised our taxes, it moved the math in favor of Corpus Christi. It lowered the rate of return on equity that could be earned in Louisiana versus Corpus Christi." Whoever wins this project, the economic impact will be huge for years to come, Scott notes. "The construction jobs created would be in the thousands for two to four years," he says. "And then, if it is that big, it becomes a true game changer. You're talking hundreds of direct jobs, and jobs in the chemicals industry are the highest paid in the manufacturing sector." This PET solid-state polymerization reactor is part of a $1.2-billion expansion by M&G Chemical in Corpus Christi.